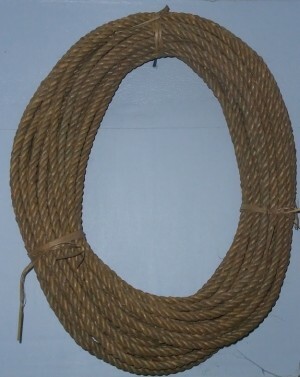 This is a picture of a coil of rope which was used in days gone by to purchase food from the local shop. In those days there were no supermarkets. I lived in North Side, to be exact in Hut Land. There were two little shops where you could purchase goods mainly food, flour, sugar, cornmeal, lard and a few other products. I lived in Hutland with my mother and on Saturdays when there was no school we would get up early in the morning and go into the bush where the thatch palm grew and cut the 'tops' from them which was to make the rope. We wuld take the finished rope to the shop to obtain groceries. We used a basket which was also plaited from the 'tops' of the palm tree to put the 'tops' into to transport them home, usually a basket could hold about one hundred 'tops'. On arriving home it was my duty to tie the tops with a piece of string taken from the 'top' and then spread them out in a portion of the yard where they would get to be dried from the heat of the sun. I had to spread them out each morning and pick them out at the end of each day. The 'tops' were fully cured in about a week. When the 'tops' were fully cured my mother would give some to other people to stwist strand to make the rope. The rope consisted of three strands of twenty-five fathoms long woven together to make a rope, of course she had to give that person a share of the completed ropes. Now to make the rope there was a cart at one end and a wench at the other end. The cart had one handle and the wench had three handles. The wench was the part that kept the strand wound up tight and the cart was the part that twisted the three strands to form the rope. 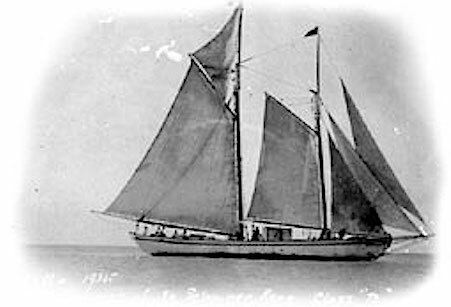 After the ropes were sold to the shops for food, they were then shipped to Jamaica to be used as the anchor ropes for fish pots used by the fisherman to trap fish.